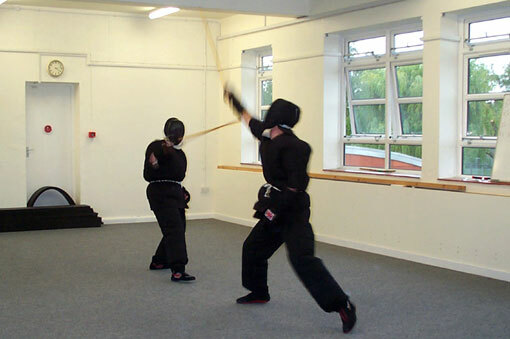 Canne de Combat is a traditional french stick fighting art consisting of striking techniques with the right and left hands, blocks, feints and combinations aimed at pre-defined areas of the opponents body, head and legs. It is a long range, and graceful art, involving stylish striking and athletic movement. In competition, padded clothing, gloves and headguards are worn. Members of Cambridge Academy have represented Great Britain in world and european championships. Fred Berst, Jon West and Morgan Alexander took part in the Championnat du Monde de Canne de Combat held in Réunion in October 2004. Julie Gabriel, Morgan Alexander, Newman Burdett and Stu McIntyre took part in the European Canne de Combat Championships in Strasbourg in October 2006. A report of this event is available on the GBSF website. Fred is shown here teaching a beginners class. Jon and Morgan working out in full protective equipment. 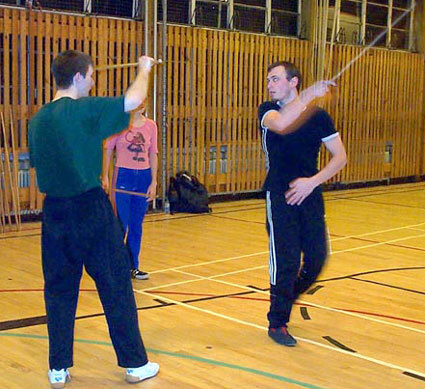 Classes run on monday evenings at St bede's Sports Hall, Birdwood Road, from 6.30pm to 8.00pm. Beginners always welcome! As you can see below, wheelchair users also participate in Canne de Combat. This video shows a demonstration at the European Canne de Combat Championships in Strasbourg October 2006. The canniste "en fauteuil" is Sebastien Pilot.